(Bloomberg) -- Yes Bank Ltd. is planning to raise about $500 million through a share sale to institutional investors as it seeks to bolster capital ratios and expand lending capacity, people with knowledge of the matter said. The Mumbai-based lender, led by new Chief Executive Officer Ravneet Gill, is talking to potential advisers about the fundraising, said the people, who asked not to be identified because the information is private. The bank plans to wait until it reports earnings later this month before it starts marketing any deal, the people said. A stock offering would help Yes Bank improve its risk profile and support loan growth after years of rapid growth. 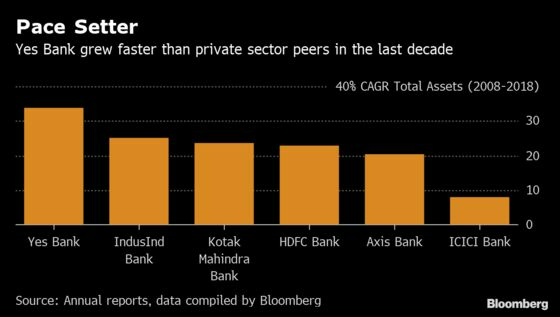 In the latest fiscal year, the bank’s Tier 1 common equity ratio, a key measure of financial strength, fell to the lowest among its major Indian private-sector peers as lending increased. A spokesman for Yes Bank didn’t immediately respond to an email and a phone call seeking comment. The ET Now television channel reported the share sale plans earlier Thursday, citing people it didn’t identify.